Essene Market & Cafe: Organic, Healthy, Tasty! I am vegetarian and am constantly looking for good places to eat at. I found Essene Market & Café, and I was delighted to see it had all natural and organic foods. They used no preservatives or artificial ingredients. They also used all locally grown products. It is not only an organic restaurant but also a grocery store with top quality produce. I have been there multiple times and have tried everything from their salads to their pasta. They have some great desserts in their bakery. Their heavy chocolate cake is absolutely heavenly. Also, their menu is constantly changing which makes going their always exciting and a new experience. I am also a fan of different ethnic cuisines and they feature dishes from all over the world like Indian, African and Japanese. On any given day I would enjoy just getting a platter of their fresh fruit; it is quite refreshing. I am glad to have found an organic restaurant, completely vegetarian and very healthy. 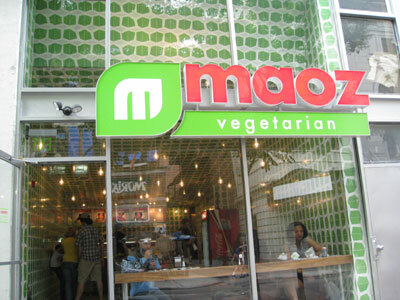 Maoz Vegetarian is a wonderful organic vegetarian establishment located on South Street in Philadelphia, PA. Sitting in the middle of the cultural heart of The City of Brotherly Love, Maoz Vegetarian is a unique, delicious alternative to the average cheese steak joint. Maoz Vegetarian specializes in falafel sandwiches that are healthy, yet tasty. The hearty serving of falafel is packed in to all-natural pita bread. You then have a choice of toppings and fillings at the salad bar-like topping station. I highly recommend the garlic sauce and cauliflower as a must have addition to the delicious falafel. The Maoz Experience from Maoz Vegetarian on Vimeo. Also, you have the option of organic Belgian steak fries, fried in all natural olive oil. This combination of falafel and potato is a mouth-watering adventure for your taste buds. Though the establishment is small in size, the food is large in taste. This is my favorite organic restaurant that I have visited. Do yourself a favor and check it out!